You have a career goal …we can help you achieve it! 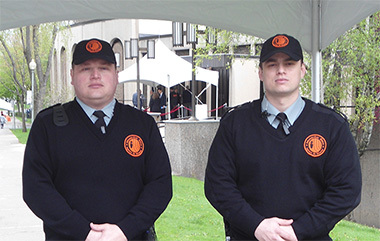 Our private security guarding training program for security agents meets the requirements of the Bureau de la sécurité privée in order to obtain a security agent licence. Excellent employment rate - approximately 90 % of our graduates get a job within one month after receiving their security agent permit. We constantly innovate to provide the best training program and the best price/performance ratio. We are proud to offer an exceptional customer service that meets the high expectations of our students. Complete training program that provides students with the interpersonal and professional skills required for a career as a security guard. Courses are designed to provide students with high-quality theoretical and practical teaching and learning. We personalise our teaching as necessary to ensure that the learning needs of all students are met. Assist integration into the work environment. There are good reasons to trust us with your new career project! For more information and to register call 514-399-0540 or visit us Monday to Friday between 10 am – 5 pm. No appointment is necessary. Excellent training, very professional, well thought out and well designed course! I obtained my security licence, but, most importantly, I gained knowledge and confidence in myself. I do not have a moment on the job where I feel unable to perform to my best ability. This course is a great fit for anyone new to the security industry or those with many years of work experience in this field. Thanks for your commitment to your students and to delivering real value. The program is informative and offers valuable hands-on practice in applying security-related skills. Excellent explanations and scenarios. There were lots of helpful tips and interesting facts. Very timely for myself and where I am in my career, particularly as I am going on to a change of career path. Now I feel confident and ready to jump into the arena of security services. Highly recommended for everyone looking into a security agent career! It was my first real exposure to the security industry. I learned so much. It was flexible, interesting and challenging. This course was above and beyond what I expected. This course gave me understanding and a great foundation to build upon. Given by an instructor who gives very clear and interesting explanations to back up the course material. I would love to have a follow up course on the same subject! GREAT value!